Volquartsen's Ruger® Mark IV™ Accurizing Kit enables you to easily swap key factory parts with upgraded replacements to get better performance from your pistol. Includes an upgraded trigger that allows precise pre-travel and over-travel adjustment, plus upgraded hammer/strut assembly, hammer bushing, sear, plunger, and spring. After the upgrades are installed, you will enjoy noticeably smoother, tighter, and more precise operation from your Mark IV™. The Volquartsen Ruger® Mark IV™ Accurizing Kit will give your pistol a crisp, clean 2.5 lb. trigger pull, and it also eliminates the magazine disconnect. Fits all variations of the Mark IV™, including 22/45™ Gives a crisp 2.5 lb. trigger pull Hammer and sear are wire-EDM cut from A2 tool steel for excellent wear resistance & retention of tolerances Trigger’s black anodized finish matches blued guns and also provides attractive visual contrast on stainless steel guns Comes with necessary hex wrenches & threadlocker for installation The Volquartsen Ruger® Mark IV™ Accurizing Kit is an easy, fast way to get even better performance and shooting enjoyment from an already excellent rimfire pistol. Looks like a great kit, and I was excited to improve the trigger on my Mark IV Hunter, but the kit was either rushed or not fully tested and there are some fitment issues that can result in a jammed hammer and non-functioning pistol. Hopefully a revision comes soon. The strut on the hammer was either riveted on by Volquartsen backwards or not correctly shaped, and causes the hammer to jam in a horizontal position past where it would normally engage with the sear. The strut wedges itself in the cavity of the spring plunger jamming the hammer down. It can unpredictably let go seconds after pressing and holding the trigger or won't fire at all. Needs filing and fitment or replacement. As told by Volquartsen, sometimes the Volquartsen disconnector (the one for the Mark II and Mark III are a direct fit in the Mark IV) is needed to make this accurizing kit function correctly. Apparently sometimes it works without and other times not, differences in manufacturing frame tolerances I guess. That is exactly the issue I had, the hammer position and jamming had nothing to do with it. As soon as I got the disconnector all my issues were solved and my MkIV hunter has an amazing trigger is and is a real joy to shoot! Kit is drop-in with no hand fitting required for installation. VQ parts are same quality as factory or better. The VQ trigger seems to have less side play on the pivot pin as compared to factory trigger. My kit came with a VQ disconnector (not shown in Brownells photo) included in the package. Definite +++ improvement over factory trigger - highly recommended upgrade for MK IV owners. NOTE 8/31/2017: This kit now includes the Volquartsen Trigger Bar aka Disconnector. The trigger is amazing with this kit, and the removal of the mag disconnect is a welcome benefit. You can eliminate almost all of the pre-travel and over travel. The break on this is very crisp and light. The kit also includes allen wrenches for the pre-travel & overtravel set screws, and a small tube of blue loctite for the set screws. It is a very complete package. I just purchase this kit and installed it myself. Iâm not a gunsmith by any means but I have tools and abilities to learn how. I looked at there online install instructions and a 28 mmiute YouTube video that made it all very easy for me to exchange the parts. I watched the video all the way through then I went to work watching the video and performing task one step at a time til I was done. I finished and tried it all out and Iâve shot a 100 rounds or so now and Iâm a very happy Ruger 22/45 Lite Mark IV owner. I bought this Volquartsen kit a month ago and was dreading putting it in my brand new Mark IV competitionâ¦ Turns out there was nothing to worry about. I followed the official directions by Volquartsen coupled with an excellent how to video by Captain Gyro on Youtube (excellent presentation) and the installation went swimmingly. It took me about 2 and a half hours and there are two things friends told me that were very helpfulâ¦ Do the install in a big boxâ¦ little springs and plungers can go flying, also put a large piece of cardboard on the floor and if you drop something so you can easily see it. The other thing is that the Volquartsen hammer installation can be trickyâ¦ watched the video 2 or 3 times, then did the install along with the video pausing it, did the work and continued on thru. This kit resulted in an exceptional trigger... much better than I even thought it would be. Break is so clean I have to say that it is a better trigger than my old Gold Cup National Match. I would recommend this in a heartbeat. It is easy to install if you are handy and watch the videos. Bravo Volquartsen. I have owned all versions of the Ruger Standard Auto, including the .22/45 and the MKIV is the best yet. The Volquartsen Accurizing Kit really takes these pistols to the next level. I installed the kit in a MKIV Target today and the trigger went from "OK" to "Amazing." It now rivals the best High Standard or Smith Model 41 triggers. Installation was straightforward and the new kit includes a Volquartsen disconnector, which should eliminate the difficulty another reviewer had. I followed the on-line directions from Volquartsen and had no problems. On function testing, I discovered that I had taken out too much pre-travel and was getting failure to reset, but a quick adjustment and the pistol functions flawlessly. This is the single best modification you can make to your pistol to improve its performance. Just remember - this kit deactivates the magazine safety, so tell everyone who uses it that the gun will fire with the magazine removed. Safety first, last and always! TL;DR: The volquartsen accurizing kit is without a doubt worth getting. I recently bought a ruger mk iv 22/45 lite after watching a ton of videos about it and the alternatives. Every video I saw recommended installing this kit. I was super skeptical, but I went ahead and bought it. I am so glad I did. I took the Ruger to the gun range before the volquartsen kit was delivered. Its my first 22 and I was completely unprepared for how failure prone 22lr ammo is. Between ammo failures and the mushy, grindy, tactile feedbackless trigger, I was ready to throw the gun in the trash. The volquartsen kit arrived the next day and after spending an hour or so (mostly spent looking for needle nose pliers to no avail) installing the kit, I gave it a try. I am in love. This volqaurtsen kit is freaking fantastic. It turned my expensive paperweight into a real gem. A few notes to people who have read this far. 1) make sure you vacuum before you start to install this. Its really easy to find the tiny little springs you drop when they are the only thing on the floor. 2) have the ruger manual handy. random springs and bits will fall out with no obvious sign as to where they go. The exploded view in the manual really helps. I was a bit nervous ordering the volquartsen kit and installing myself. Plenty of members on forums had difficulty and had to throw in the towel and send it in to volquartsen or a gunsmith to complete. By no means am I what you'd call a "handy" person, but what I am is Cheap....and I wasn't about to fork over an extra $80+ to have it installed. There's a fantastic video on youtube that walks you through the whole process. Took me just under 2 hours to complete because I couldn't find my needle nose pliers, otherwise it would've taken half the time. All you're doing is removing some parts, and putting in new versions of it. No fabricating, gun smithing, or anything you can't do with your own fingers. Easy. Brownell supplied all the parts for the 22/45 version. The lightened trigger pull, and crisp trigger break is immensely different. This is the very definition of a hair trigger. Worth every penny in my eyes. This should be your first modification before even spending money on optics, a must-have. The kit also included a VQ Trigger Bar. I received it, installed it fairly easily following the instructions on the VQ website, and took the pistol to the range. Results? Amazing. Simply amazing. The trigger went from 5.5 LBs to 1.5Lbs, it is very smooth, and has a nice reset too. This is a fantastic upgrade to an already excellent pistol; it takes the MK IV to a new level with one of the best triggers I have ever felt on a handgun.. My groups shrunk dramatically with this awesome VQ Trigger Kit. You MUST be able to go on-line to the VQ website for instructions. These require you have the Ruger manual for the parts diagram. 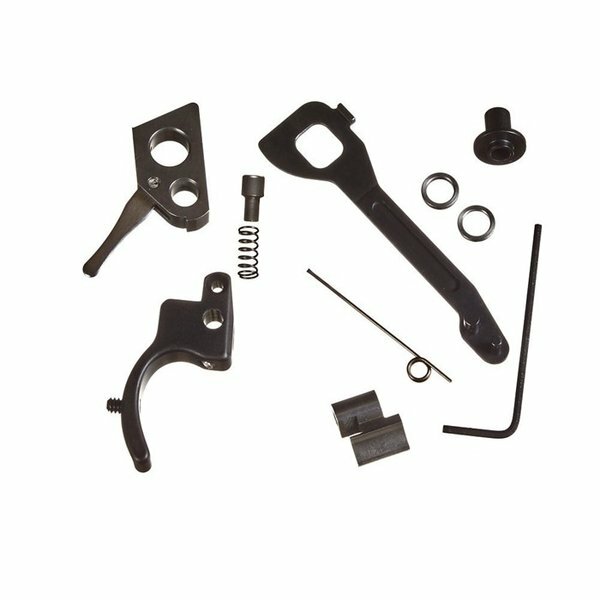 The kit comes with a trigger bar, but the on-line instructions do not reference this as a VQ part and the pictures show use of the original factory part. You will have some parts from the factory that you do not replace and there is no VQ equivalent. These are not explicitly listed. Noted my factory Ruger manual has two different parts labeled with the same number (24). One of these is a discard part. Step 6 of the on-line instructions refers to an optional spacer washer. I believe this needs to fit inside the large hole in he replacement trigger bar. Mine did not (barely), and before I discovered that I found that the safety took a lot of effort to engage and the hammer would not release from the sear. Once I put things together without this washer everything was fine. Needless to say this added a good amount of time and annoyance to the install. I'd give it 5 stars if it weren't for the installation hassles (assuming it functions properly with live ammo of course!). I bought this for a new 2245 Lite. I read Volquartsen instructions on-line. Not specific to the 2245 Lite. Watched every Youtube video I could find; nothing directly tied to the 2245 Lite and this kit; although at least one high quality one by Capt Gyro that was very helpful. I have put non-stock triggers in Glocks; 1911's; AR15's; Rem 700 and SCAR's. 1911 is the toughest for me; this was difficult only because it was not well documented on-line. Installed it; beautiful smooth; crisp trigger. Function test fine; but at the range; 60% light strikes; noticeably light; failure to fire with 3 brands of ammo. A Volquartsen firing pin solved the problem. If you install the kit correctly and have a problem; get in touch with Volquartsen to work it out. It is worth the effort; but it was frustrating for me. Obviously not everyone encounters this. A five star only because Volquartsen solved the problem. Mfr Part: VC4AK 810162014407 Volquartsen's Ruger® Mark IV™ Accurizing Kit enables you to easily swap key factory parts with upgraded replacements to get better performance from your pistol. Includes an upgraded trigger that allows precise pre-travel and over-travel adjustment, plus upgraded hammer/strut assembly, hammer bushing, sear, plunger, and spring. After the upgrades are installed, you will enjoy noticeably smoother, tighter, and more precise operation from your Mark IV™. The Volquartsen Ruger® Mark IV™ Accurizing Kit will give your pistol a crisp, clean 2.5 lb. trigger pull, and it also eliminates the magazine disconnect. Fits all variations of the Mark IV™, including 22/45™ Gives a crisp 2.5 lb. trigger pull Hammer and sear are wire-EDM cut from A2 tool steel for excellent wear resistance & retention of tolerances Trigger’s black anodized finish matches blued guns and also provides attractive visual contrast on stainless steel guns Comes with necessary hex wrenches & threadlocker for installation The Volquartsen Ruger® Mark IV™ Accurizing Kit is an easy, fast way to get even better performance and shooting enjoyment from an already excellent rimfire pistol.